Shades of red, non-magnetic, files easily and doesn’t spark when held to a grinder. Bare Bright: Referred to as bright and shiny because of the color (like a new penny). Typically bare bright is like new heavy residential wire and industrial wiring. It contains no plating or coating. 12 gauge & heavier. #1 Copper: This type of copper is unplated, with no solder, paint, or corrosion. #1 copper may be found in tubing, plate, or wire. It is used in wiring and plumbing. 12 gauge & heavier. 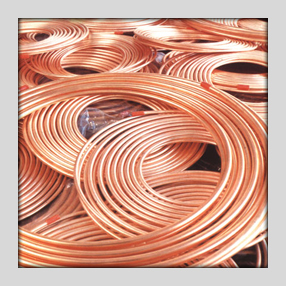 #2 Copper: It comes from burnt wire, tubing or sheet that may have paint, solder, or corrosion. It is also known as enameled (plated) copper. #2 copper is also used in wiring and plumbing. #3 Copper (Sheet Copper): Sheet copper is used to make gutters, flashing, roofing, and art.